Work on Simple Lightbox’s admin overhaul has been moving along quite well. Here’s a quick snapshot of what’s been done. The first task was to remove all options-specific references from the admin code. A fair bit was refactored into the options controller class (SLB_Options) so I wasn’t starting completely from square one. Additionally, I did a quick sweep to remove unnecessary or inefficient code from the admin classes. Now that the code was nicely organized, the focus was turned to building the UI for admin pages. As previously mentioned, this would be accomplished with add_content(). SLB’s add_content() method draws from WordPress’ own add_meta_box() in terms of the method signature. At it’s most basic, add_content() only needs to be passed a unique ID, a title, and a callback. It’s important to note that add_content() is fairly “dumb”. Basically, it just saves the parameters that are passed to it for later reference. The content blocks are processed only when the admin page is actually being rendered. This means that no extra work is done unless it’s absolutely necessary. Once the parameters have been saved, add_content() returns a reference to the admin page it’s attached to so that additional add_content() (or other) methods can be chained to the page. This makes it even faster and easier to add content to the page. Adding content to an admin page is very simple with add_content(). The callback (callback_pri()) generates the output for the content block on the admin page. Now we have two content blocks on the admin page. We can also add more complex data beyond simple callbacks when adding content to a page. 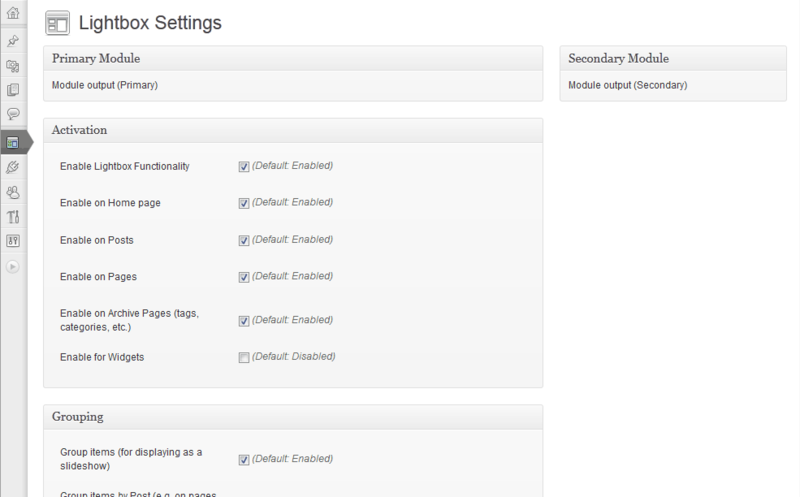 The callback (admin_page_render_content()) builds the options UI. There’s really not much more to it. I’m really liking this methodology because it makes building an admin page very simple and straightforward. At the same time, it’s also very extensible– any type of content can now be added to an admin page without too much work. That’s all it takes to add a new action to SLB. Again, barely any other processing is done until the action link as actually clicked. When clicked, the action allows other code to hook into the event and do something. A message is then displayed based on the action’s results. By default, a single object is passed when the action is created, but just like admin pages, an action can have multiple pieces of data attached to it. The action will process each piece of data, allowing any amount of events to occur when an action link is clicked. Page groups will allow admin pages to be further segmented and organized, allowing better organization of the UI. This will likely use WordPress’ tabs initially. SLB’s options are organized into groups (e.g. Activation, Grouping, etc.). From an organization standpoint, it makes sense to display only a certain selection of related option groups on an admin page (and other option groups on a different admin page). As with page groups (see above), the focus is on improving organization. The final step in the admin overhaul is to refactor these new features so that they’re accessible to all admin components (menus, pages, sections, etc.) where appropriate. This will provide a consistent interface for all admin components.